Heat oven to 350°F. Spray 2-quart round casserole with cooking spray. In 2-quart saucepan, heat quinoa and water to boiling over high heat. Reduce heat to low. Cover; simmer 10 to 15 minutes or until all water is absorbed. Meanwhile, in 12-inch nonstick skillet, heat 1 tablespoon of the oil over medium-high heat. Cook chicken, salt and pepper in oil 6 to 8 minutes, stirring occasionally, until chicken is no longer pink in center. Remove with slotted spoon to bowl. Reduce heat to medium. Cook shallots in remaining 1 tablespoon oil 3 minutes, stirring occasionally, until tender. Stir in broth and preserves. Heat to boiling; remove from heat. Return chicken to skillet, discarding any juices in bowl. 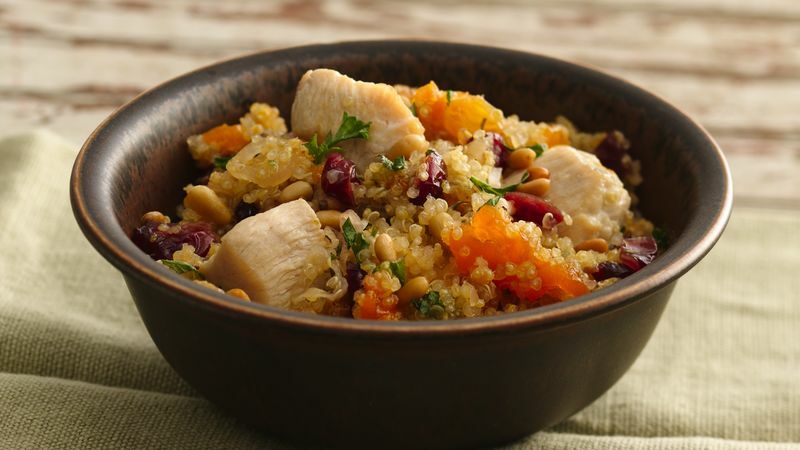 In casserole, mix cooked quinoa, chicken mixture, cranberries, raisins and 3 tablespoons of the parsley. Sprinkle with remaining 1 tablespoon parsley and the pine nuts. Bake uncovered 15 minutes or until thoroughly heated and nuts are toasted. You can change up this recipe by substituting other favorite grains, such as rice or couscous, for the quinoa. Quinoa, a grain native to South American cuisine, is pronounced KEEN-wah. It contains more protein than any other grain and has a delicate, bland flavor that takes on the flavors of ingredients it’s paired with.